Want to pay your bill without logging in? As an added convenience, UFG offers Express Bill Pay for our policyholders, giving you the option to make a payment online without logging in. Simply enter your policy number or account number and zip code below and select Pay Now. You must then enter the required payment information for your debit card, credit card or electronic check. Let us help you locate your policy/account number. Questions about your bill or payment? Contact UFG Billing Customer Service at 800-637-6309 between 7 a.m. and 6:30 p.m., CT, Monday through Friday. If you are having issues using Express Bill Pay, please ensure that your web browser allows pop-up windows from our site. Note: Our website and other online services are available to both personal and commercial policyholders of UFG, excluding commercial surety and contract surety customers. 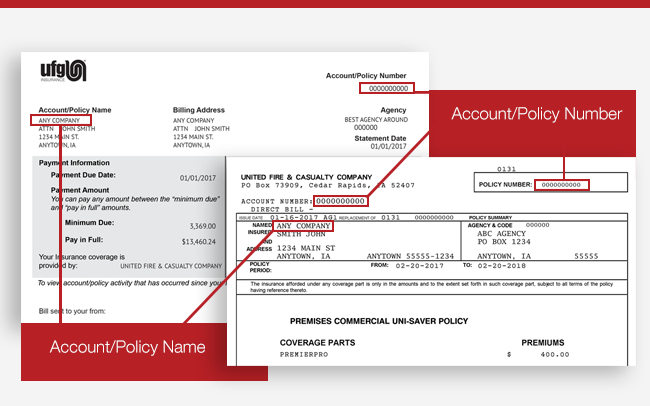 If you are an insurance agent making a payment on behalf of your customer, it is your responsibility to maintain a signed authorization on file verifying that the payor agreed to have the payment withdrawn from their account.